POEditor users have multiple options for translating their software strings. They can bring their own translators, crowdsource translations using public projects, use machine translation engines, or even opt for third party human translation services. The latter feature is provided in partnership with well-reputed human translation platforms in the industry. Until recently, as a POEditor user, you had to access each localization project to order human translations for it. And you had to repeat this process for each language. Because our users made us aware they wish to accelerate this part of their workflow, we’ve made some small changes. 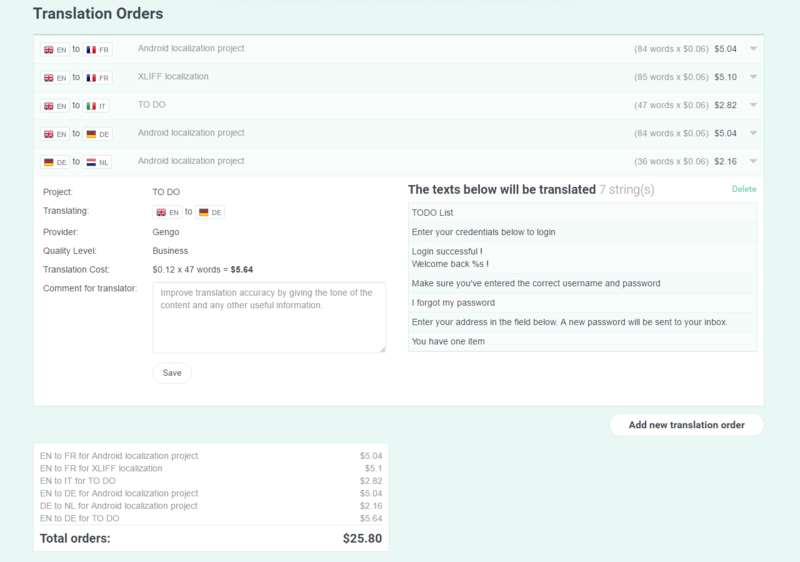 In essence, you can now place orders for any project in the same page, and can order as many translations as you want, at the same time. When starting a new order, you’ll see all your pending orders (for which you’ve requested a quote, but haven’t paid yet) listed at the top of the page. After choosing the variables for the new translation order, you’ll reach the payment page. Here, you can cancel any pending order by clicking on it and then on ‘Delete’ in the top right corner. When only the translations you want to buy are left, you can pay for them simultaneously by hitting ‘Purchase order’. You’ll see the total cost for all the orders above the payment details. If you’re not familiar with POEditor’s human translation feature, a step-by-step guide to placing an order is available here.